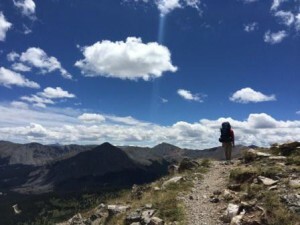 Late August is a special time to be in Colorado’s Alpine regions, cool nights and mornings coupled with fairly consistent weather make for ideal conditions for thru hikers and peak baggers alike. Whether it’s early morning frost on your rainfly or a hint of changing color in the trees, you can feel a distinct trace of fall in the crisp mountain air. Shivering at twilight as you watch the rays of splendid alpenglow dance across the peaks above you, you’ll almost forget how hard you sweated slogging up the ridges and alpine passes of midday. For the last two weeks the CMC Stewardship Team has been out on the Continental Divide trail in partnership with the CDT Coalition and the US Forest Service’s Salida District to take a rapid inventory of trail conditions via a new experimental smartphone application: Fulcrum. 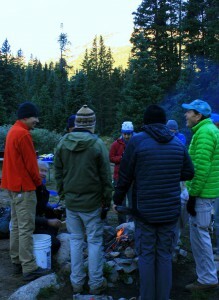 In many ways a dream project for the team, we were essentially tasked with backpacking a certain number of miles each 4 day work week with the goal of completing minor trail work along the way while taking note of more major trail-work needed via the Fulcrum App. 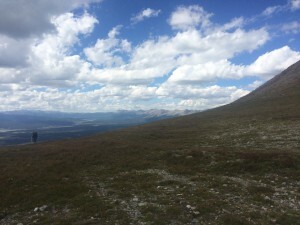 Our assigned segment of trail was from Cottonwood Pass south down to Marshall Pass, a grand tour of the South/Central Sawatch Range that took us along the West side of the Collegiate Peaks and eventually over Monarch Pass. Like clockwork, each afternoon saw a consolidation of dark clouds begin over the West Elks in the distance and spread east towards the Sawatch and Arkansas River Valley Below in an ominous march of building crescendo. By the time these storms reached their zenith, it was best that only the vocal pika and curious marmot remained above tree line to witness their authority in the alpine. 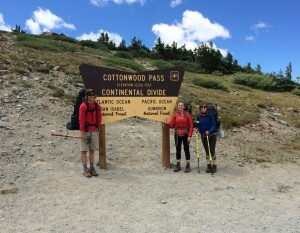 Our first week hiking we were able to cover the 24 miles assigned in a quick day and half, which allowed us to rendezvous with a Volunteers for Outdoor Colorado crew working on a Colorado/Continental Divide Trail Re-Route near the Alpine Tunnel trailhead. 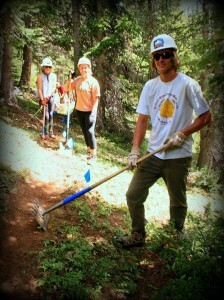 It was inspiring to see so many outdoor oriented volunteers from different backgrounds come together to work on such a cool and impactful project, and once the day’s hard trail work was over the merry making around the campfire was quick to begin. Back on the trail our second week, we continued south from the Alpine Tunnel and quickly made friends with a host of thru hikers hoping to complete the Colorado Trail. Although many of our new acquaintances were initially jealous that we were getting to hike for our job, there was a resounding message of thanks that came from everyone on the trail who we talked to about our work. We arrived at Marshall Pass at the end of our second week along with nearly a hundred mountain bikers riding the Monarch Crest trail. In the shadows of looming Mt. Ouray we set up camp and reflected on the trail we’d covered and progress we’d made. Sitting around camp in the orange evening light it felt good to know that our work and the work of the Colorado Mountain Club in general is going towards creating and maintaining these incredible trails like the Colorado, Continental Divide, and Monarch Crest Trails so that we can continue to enjoy these spectacular landscapes with our current and future friends!